Doing the full-length of the Gibb River Road in the Kimberely was a key target for the pre-planned portion of our trip and most other desired targets were to fit in around this leg (and Karijini National Park). It hasn’t turned out that way, sadly. The one thing we’ve learned on this trip is to go with the flow – not all goes to plan and make the best of what thrown at you. In this case, the heat up here in the Kimberley so late in the off season and just before the wet begins, is already so oppressive. Unless you have powered van sites everywhere you go to plug in the van’s A/C when you arrive, it’s almost unbearable and certainly not much fun in any van if you cannot find a mostly shaded spot to park it under. Therefore sleeping of a night can somewhat be a challenge. Notwithstanding this, the key places on the Gibb we wanted to visit were mostly from staying at free bush camp sites well off the Gibb road (e.g Jacos & Honeymoon) and most are not powered stays for A/C use and without a generator. Our initial plan months ago was to get here much earlier in the season when it’s a lot cooler so we would not have to worry about A/C use and could pick and choose anywhere we planned to see, within reason of prevalent road and river conditions and not having to worry about the temps so much. 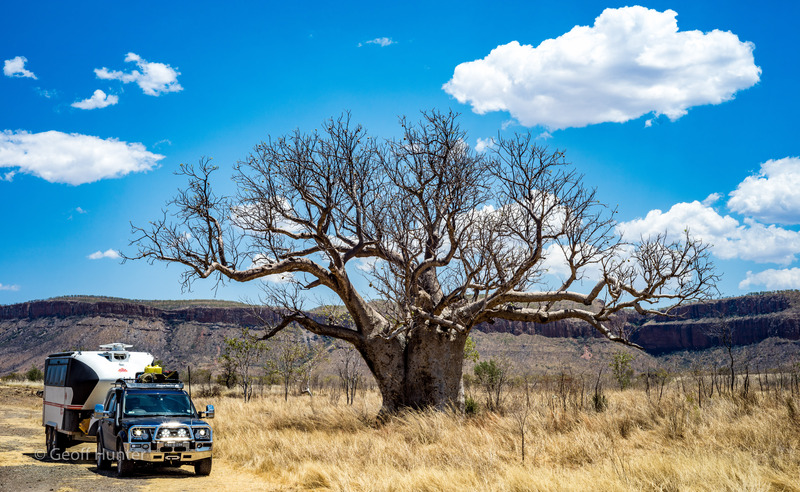 It didn’t turn out this way for us unfortunately so we came up with an alternate plan (b) with a change of route to reach the WA west coast and still get in some of the better parts the Gibb River Road has to offer, albeit this time of the year. 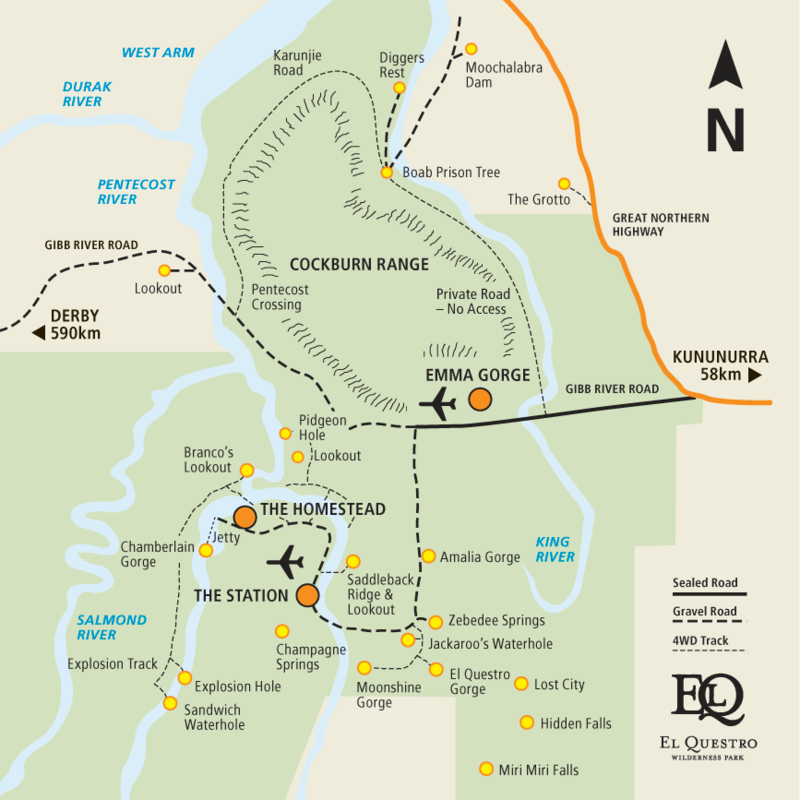 Map insert of El Q Station – some of the 4×4 tracks to get to some of the gorges where great fun with a couple of deep water crossings thrown to keep you on your toes. 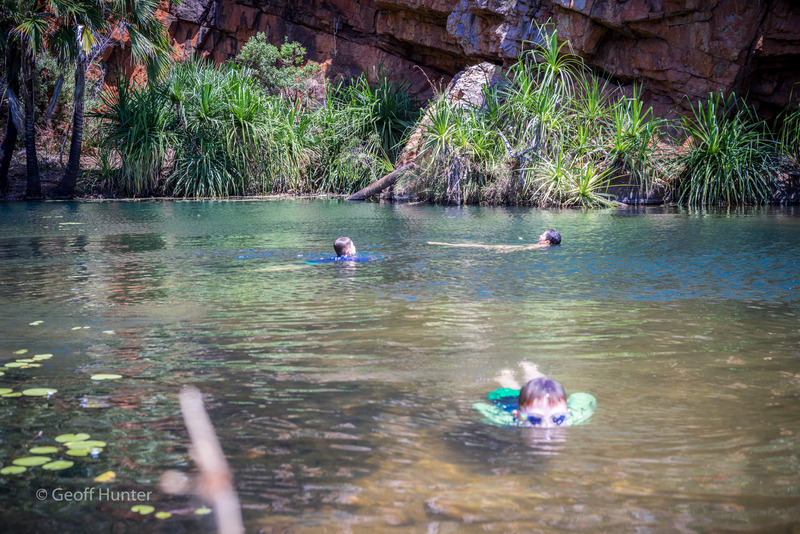 So our plan B was to do some of the many gorges on the eastern end of the Gibb River Road and use the El Questro Station as our camp base for a few days and do day trips out and back to a gorge before midday when the heat is really fires up. We would then lounge in the upper Pentecost River that runs through the middle of the station camp ground (only has the odd fresh water Croc in it) with a beer or two in hand for the rest of the afternoon whilst waiting for the sun to set behind the Cockburn ranges so we could then think about cooking dinner. Emma Gorge: Emma was high on our hit list however we were informed by station staff one evening it was shut down for the remainder of the season two weeks before we arrived. I guess they anticipate an early wet this year? Bummer! We did hear about a cane toad experiment started at Emma gorge a few years ago that did not go to plan – but more about that if I get around to creating a blog on the massive impact the toad has had on this part of the world – quite incredible and sad. Zebedee Springs Gorge: This is a famous spring which is at a constant 30 deg. This sounds hot, right? Well it is, however it was still refreshing as it was a lot cooler than the ambient temp. We all frolicked for two hours or so in neck-high spring water and the boys had a great time looking for frogs and interesting rocks for their collections – we loved it. Moonshine Gorge: Next day we upped the challenge to a strictly 4×4 entry to a gorge called ‘Moonshine’. The cover shot of this specific blog is of one of the deeper creek crossings you have to navigate to gain entry to this beautiful gorge. I’m very proud of Celia in taking it on whilst I checked out its depth and the best way across before taking a photo. 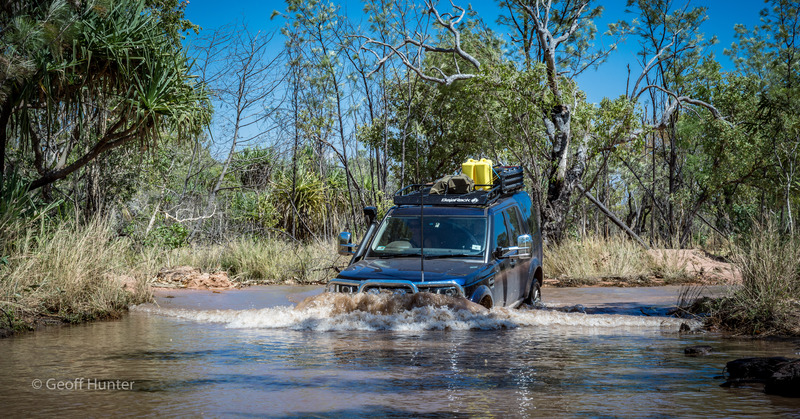 Glad we had a snorkel put on the D4 as the water level came up over the door sill and we even had it in the D4 high suspension setting. Whilst at Moonshine, we had the entire gorge to ourselves and nothing but the sounds of numerous black cockatoos and other desert dwellers breaking the blissfulness of this truely awesome spot. Celia and Aidan enjoying some respite from the heat whilst Lochie impersonates a local fresh water Croc. On the way back we dropped off to another gorge and then swung by the local jetty on the back of the Pentecost proper (where the homestead is situated) and Celia spotted a pair of Brolgas off by the side of the road – what a fantastic sight to see these magnificent birds but they were far too shy for us to get a shot of them. Ah well, maybe another time in another place? Back to base, we soon sought the river once again for the afternoon and that night (our last night at El Q) we arranged to have dinner at the station restaurant with the Dudin family – a fine meal it was and we shared a nice bottle of wine, all whilst the boys from both families were hunting for cane toads. 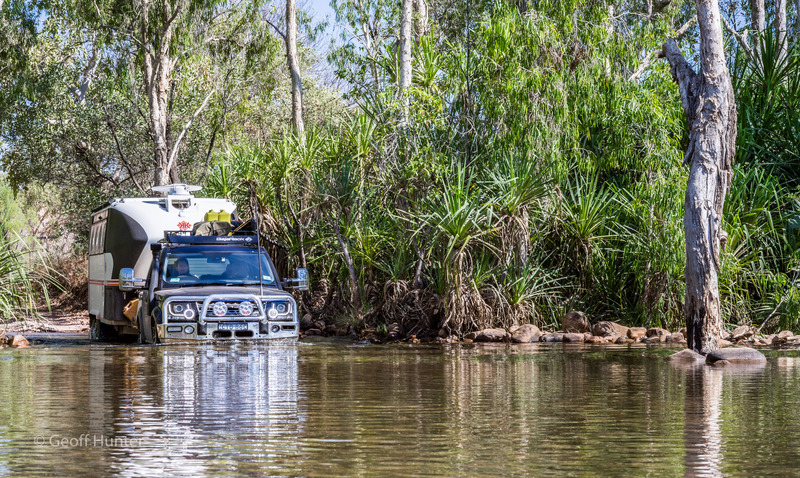 It was soon time to move on and here is a shot leaving crossing the upper Pentecost river just outside the El Q entrance with Celia for the first time towing our van across a stream. Next stop the Bungle Bungles. Celia crossing the delightful looking upper Pentecost River on El Questro Station whilst I took a quick snap.